California Creativity Association AKA California Destination Imagination is the Destination ImagiNation Affiliate for California. Both are 501(c)3 not for profit corporations. Our mission: California Creativity nurtures and celebrates creativity, develops team problem-solving skills and promotes divergent thinking for participants of all ages throughout California. California Creativity encourages people to seek help when acquiring skills and to look within themselves for inspiration. With the skills of creativity, self-respect, cooperation and understanding of others, participants will use their knowledge to travel uncharted paths to help make the world a better place in which to live. California Creativity’s goal is to promote creativity and creative problem solving skills in the youth of California. To that end, it conducts activities such as tournaments, training, seminars and other activities throughout the state via its regional operating committees. Its method is to use dedicated volunteers at both the state and regional levels to provide the Destination Imagination program. These volunteers take on roles as officers, trainers, challenge specialists, etc. Destination Imagination is presented to youth teams organized by Team Managers who acquire annual (school-year) program team packs. Schools and other community groups qualify for group memberships. Team Managers are the face of the program to the youth on the team. Team Managers help the team understand how to solve challenges creatively, and then step back and let the team create their own solution. Adults who are unable to serve as Team Managers have other opportunities to support the program, e.g. as Tournament Appraisers. Though California Creativity is staffed by volunteers, there are still expenses to produce the program materials, acquire tournament sites, etc. 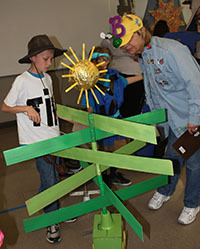 The Destination ImagiNation program recoups its expenses via the sale of program memberships. California Creativity recoups its non-Tournament State expenses with an Affiliate Fee on top of the DI membership fee, and its Tournament expenses with a Tournament Fee (for those teams advancing to State Finals). Regional expenses are handled differently in each region: some have a flat team fee for the program year and others have a la carte fees for their various trainings, events, and tournament. Team Managers should contact their Regional Director early in the year to take full advantage of the help offered throughout the school year. Regions offer training for Team Managers. See the Regions page at the top of the website to find your region. Unfortunately the fees do not cover all the expenses. In order meet our operating costs, we ask foundations, corporations, volunteers and the general public to donate. These donations help us bring the program to more young people. Please consider donating to our program now.